Compatibility: Requires Android / iOS 9.0 or later. • Detailed worldwide maps and travel guides • Works completely offline even with GPS • Great when abroad, NO data roaming charges • Online routing and much more! « Reviews » “I love this technology” – Natali Morris, Tech Reporter, NBC’s Today Show Editor's Pick Best Offline Map App – thedigitaltrekker.com “The best travel app in the world… Don’t leave home without it!” – bonvoyageurs.com “Very impressive app with unmatched features.” – toptenreviews.com « Maps » • Beautiful Retina quality maps at a fraction of the size! 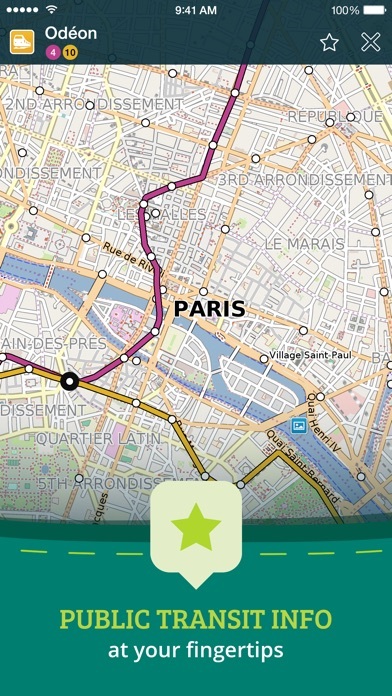 The fastest and most beautiful offline maps on the App Store! • Detailed and interactive worldwide maps! More than 100,000 places & completely free! 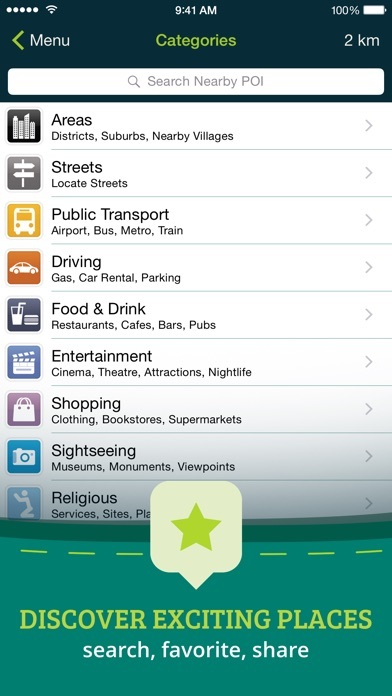 • Access your maps online and offline! Saves on data roaming costs! • Personalize the maps to show the info you want! • Online Routing with voice guided turn by turn directions. Save your multi-stop itineraries for offline navigation! • Online street address search and contacts integration! • Did we mention everything is offline? Works anywhere- cities, small towns, even in the middle of nowhere. Never any roaming charges. We dare you to try it! 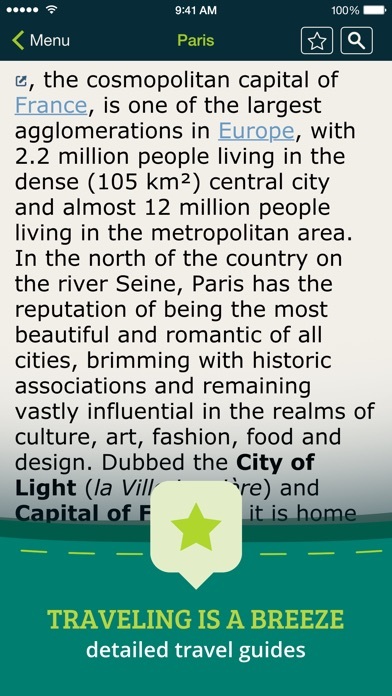 « For the Traveler » • Find out about thousands of interesting places - hotels, restaurants, bars, tourist sites, even get metro and public transit info! • Our super wide area Nearby search is also super fast! • Have all the travel info you need with more than 25,000 detailed Wikivoyage Travel Guides and more than 1 million Wikipedia articles in 7 languages! • Customizable Pins and favorites groups! Add notes and mark and share favorite spots! • Share maps links and your current location (SMS, Facebook, WhatsApp, Email, etc)! 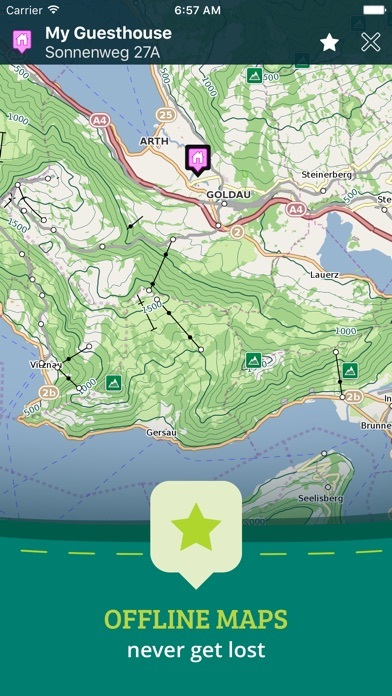 « For the Adventurer » • An in-app purchase option offers topographic maps. Get high performance, high accuracy 10m / 50ft contour display world-wide. The ONLY offline app that lets you download large areas, even entire countries! Contours are displayed on our existing maps for all Activities. • Hiking and Cycling maps! Great for geocaching and getting off the track! • GPS track recording lets you see what route you took! Great for hikes, cycling and off road! Never get lost again! • Import/Export support for GPX and CSV files! Share with friends using PE Archives. • Displays and lets you search for map coordinates (including DD, DDM, DMS, MGRS, UTM/UPS, GeoHash, and what3words)! • Numerous GPS settings for your preferred configuration including compass and heading arrow or rotation, look ahead mode, accuracy and recording settings. ...and much more - so try it out! « How's it Work? » Just select the cities, regions, or even whole countries you want to download, and it will be available for offline use, complete with information on thousands of POIs (Points of Interest), travel guides and Wikipedia articles. To do this we utilize community driven open data from a number of amazing projects. We use some magik to compress and package it in a format optimized for mobile devices. Pocket Earth then renders its beautiful vector maps on your device using our OpenGL ES based MagikMap technology. To learn more about Pocket Earth or the community driven open data sources that we use, please visit our website. Don’t forget this: 1. Using the GPS features of this app can significantly affect battery life. Only leave GPS enabled when you need to use it. Continued use of GPS running in the background can dramatically decrease battery life. Pocket Earth only uses GPS in the background for route navigation and gps track recording features. 2. 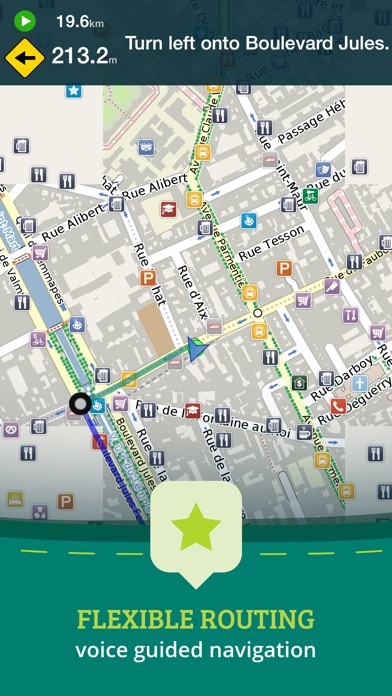 This app uses data from the amazing community driven open mapping project called openstreetmap.org! Coverage detail may vary by region, please visit our website to check the map detail for your regions of interest. 3. Does not currently support all asian texts on the map (Chinese, Japanese, etc). Am so impressed with PocketEarth from 8 years of using it all over the world. It keeps my favorite bars, restaurants and places to stay available for the future but even mundane things like ATMs and such. I can’t say enough good things about this app! I have used this app for years and I really like it.. however, I recently found an issue trying to find an offline map to download, emailed the developer 3 times over the course of 1.5 months and there has simply been no response. So I’m about to leave on my vacation and I’ll be map-less.. guess I’ll be trying google maps offline for this trip. I like to plan my trips well, and that means being able to find and mark locations on map and plan routes. I have found no better tool for this. Takes a little work to figure out how best to use - but worth the investment. My top desires for future updates is to be able to turn off all Wikipedia icons and even better ability to turn off all icons other than the ones saved - I like to print off maps that show my locations of interest but map gets too cluttered with unwanted icons. I LOVE this map. I first used it many years ago with my iTouch and now have the Pro version on my iPhone. You can navigate with iPhone even if you have no cell coverage; the GPS still works. I always pre-download maps when I travel. I can then navigate off line, which saves data fees as well as battery. The ability to switch which maps are downloaded is great, and very easy. I can for example download British Columbia topo maps for a backcountry trip; then later remove it before downloading Italy for my next trip. The level of detail and the number of "points of interest" is fantastic! I’ve even used it to navigate the Paris metro system! I d like to see more icon choices for “favorites” I save. A way to indicate a trailhead, or a picture of a car come to mind. Another update I’d like to see is that I’d like to be able to search for routes or tracks that are “Nearby”. The only way to find them currently is to search “Groups & Filters” by name date or user. Since I have dozens if not hundreds of Tracks and Routes, this is cumbersome. I usually don’t remember the name or date, and the user is always me, so I must scroll through the entire list. I've been using this reliable app for about two years and consider it to be the Swiss Army Knife of Map apps. Some have criticized Pocket Earth’s user interface. My take is that the user interface is unique, well thought out and worth the effort to learn. The developers have created a very powerful app that is capable of doing much more than is apparent at first glance. The Pin feature is useful for marking and organizing points of interest in advance and during your travels. You can chose from a number of icon and color combinations. The Track feature is great for recording and organizing your travels on foot, by bike and by car. These tracks can be split into segments simply by stopping then resuming recording so you can get a logical breakdown of track segments as you go. The ability to show or hide individual tracks and groups of tracks very is very useful. For example, you can simply use it to track then retrace your steps during your current excursion as well as view all of the previously walked segments of a given trail system as you explore it again at a later date. It's easy to create, organize and edit multiple Routes so not only can you plan the way to a given destination ahead of time but also any day trips and other excursions for when you get there. Although the routing feature requires an internet connection, like many map apps, it only needs the internet during creation, not while you are using it. Just be sure to download the applicable maps before you go. Finally, I have come to appreciate the Nearby feature which lets you find selectable categories of places of interest within a selectable distance from a location of your choice that can be your current location or somewhere else. Great app- tons of features and no recurring payments. I love it and I like the topography maps. I used it in Europe Japan and so on. Any chance for Apple Watch? When it works, it works great. It can show your location on a map even when there is no service, using the built-in GPS, provided that the relevant map has been previously downloaded. The problem with this app is that it does not respect family sharing, and if one gets a new phone, ownership of the app is lost. Restore purchases does not work with this app. If you get this app, you will need to re-purchase it for no discernible reason. Possibly. Pretty simple to use, easy to measure distance , put markers on. Ability to download maps helps. Not always complete with trails and/or landmarks but good enough. Helps you not to lose your way and to plan your routes. I’ve used it all over the world, very helpful and functional.